Motorola is expected to unveil its flagship smartphones, the Moto Z and Moto Z Play, at parent company Lenovo’s Tech World event on June 9. With these smartphones, Motorola is looking to introduce its new ‘Z’ series, alongside an ecosystem of modular backplates, previously thought to be called Amps. Now said to be called MotoMods, these backplates has been creating a lot of buzz, and now tipster Evan Blass gives us our possible first look at the MotoMods. The image leaked by Blass showcases three of the modular backplates that are expected to arrive with the Z series. The MotoMods will connect to the smartphones through connection pins at the back, bringing additional utility to the phones. 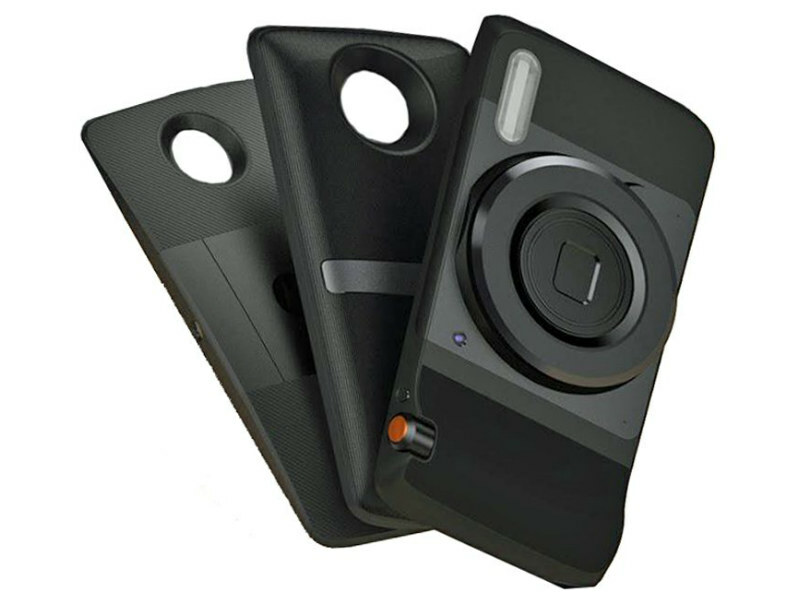 To recall, Motorola was tipped to launch five modular backplates at the event, including a battery pack, a rugged cover fitted with a wide-angle lens, a camera-style grip complete with a flash module and optical zoom, a stereo speaker setup, and even a pico projector. The first MotoMod in the leaked image shows the optical zoom lens. The backplate has a flash on its left and what seems to be like a shutter button on the right. The one behind it seems to include a kickstand, which would essentially help the user keep his phone upright while watching videos. The second MotoMod also seems to be a little thicker, and could house the battery pack as well. The third one is difficult to dissect, but it could house the pico projector or the stereo speakers. Motorola is reportedly looking to ditch the Moto X series altogether, and release its flagships under the new Z series. The Moto Z and Moto Z Play have been heavily leaked in the past. So far, the Moto Z is expected to feature 5.5-inch QHD display, a Snapdragon 820 processor, 3GB or 4GB of RAM, 16-megapixel rear camera, 32GB of inbuilt storage, and 2600mAh battery. The Moto Z Play may sport a 5.5-inch full-HD display, a Snapdragon 625 SoC, 2GB of RAM, a 13-megapixel rear camera, 16GB and 32GB storage variants, and pack a 3500mAh battery.